Mauser rifle M 1898. 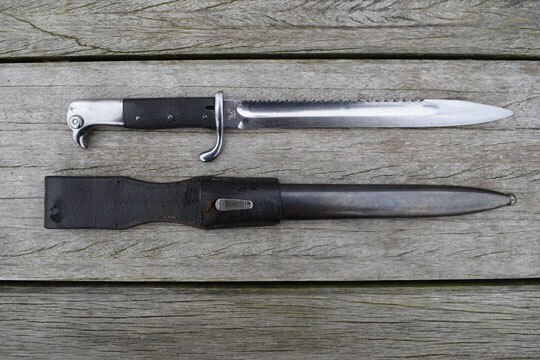 WWI kS 98 Flieger Abteilung issued bayonet. Not an officers dress bayonet! Excellent bright finished sawback blade with German makers name ERFURT under a crown (= Machine fabrik ERFURT) on ricasso. Prussian cypher of Kaiser Wilhelm II and date W 09 and inspection mark crisp on blade spine. Bright finished bird head pommel with T-O slot is marked on the left site with two crisp inspection markings. Excellent bright finished crossguard with backward swept quillon. Crossguard is unit marked F. A. 1. 157. ( = Flieger Abteilung, 1 Bataillon, (Doberitz) rifle number 157)(= Pilot squadron!) (see last picture from Ref. book Roy Williams) Excellent checkered black leater grips fixed to the blade tang with three steel rivets. Oil hole. Excellent and correct WWI blued metal scabbard with no dents. Comes with its not identified somewhat worn dark brown pigskin frog, stitched, no rivets and a central line in the back. Extremely rare Pilot Squadron marked issued kurzes Seitegewehr (kS) !